A shaken War veteran, an embittered husband-wife, a jaded grandmother with her rebellious grand daughter, a victim of communal hatred, a dreamy eyed young Indian girl and a couple of Visa Officers – what do you think would happen if they are locked in the basement of a building, with an impending threat of death hanging over their heads? I can not really comment about the survival possibilities of these people in a real life situation, but in Chitra’s ‘One Amazing Thing’, they all end up telling each other their best kept secrets – in the form of lucid stories – they tell each other to pass time, and to evade the continuous possibility of painful death. Apparently, all of them, except the two Visa Officers have gone to Indian Consulate to get permission to visit India – a country known for its spiritual largesse, alluring as a safe heaven, a promising land of salvation. However, even before any of them gets a glimpse of India, they are threatened with final liberty, as an earthquake has shattered the glass building and all of them get trapped amongst the cold walls, buried beneath the eerie silence of darkness, with all exits barred. Any normal person would find the situation bewildering, as we humans are too fond of our liberty. A minor chink in our freedom is sure to make evils out of the gentlest of souls. And this is what happens in the beginning in ‘One Amazing Thing’ by Chitra Banerjee Divakaruni as well. I am reading Chitra’s novel after quite a long time. Mistress of Spices was my last read. And, if you have been following my reviews closely, it is an open secret that I am a big fan of Chitra’s brilliance to cough up great stories, reverberating with choking emotions and profound spiritual experiences. Though, the present novel is different from her previous books. In fact, it is a novel in disguise, actually it may be termed as a collection of short stories. However, the different syntax does not mitigate author’s ability to stimulate my emotional receptacles. My feelings are sure to digress me in this review as well. And, as I write, I can hear a multitude of voices rising within me, scampering to come on top and declare my verdict. But, I need some time to make complete sense of these voices, and in the meantime, I would like to give you a glimpse of the story. As I said in the beginning, the novel is set in the basement, against the backdrop of an earthquake, which has shaken its inmates and all nine of them are in a state of shock, have suffered minor injuries and are ready to go to any extent to regain their freedom. However, the war veteran Cameron immediately takes control of the situation, tackles the immediate need of food and water, gives first aid to the injured, and morosely bundles up in a corner, unable to deal with the rising anger and frustration of his companions, and having nothing else to do than to wait for the rescue team to arrive. As is inevitable in such a crisis, each one of them suffers mentally, imagines the gnawing claws of death tightening over them every second, and they anxiously hope for some miracle to protect them from sure death. And, in such a tense situation, the main protagonist, Uma Sinha comes up with a bizarre proposal, they should tell each other stories. She is a literature student, self confessed fan of Chaucer, and being used to reading fiction akin to life, she feels inquisitive about the life stories of her companions. She wonders what makes Tauriq so aggressive, the old Chinese lady so silent and Mr. and Mrs. Pritchett so distant? Why does little Lily spoil her demeanor by donning black clothes and spiked hair? What makes Malti so angry with Mangalam? Is there a secret love affair between them or are they just the victims of forced vicinity, often misunderstood as Love? Uma realizes that probably, the crisis is a God send message to her to know the stories of her fellow beings, who are joined in death by an unbreakable placenta of Indian Visa! May be it is a perfect opportunity to let everyone divulge their secrets and relieve themselves of a useless burden they had been carrying for years, a possible moment of salvation before death. 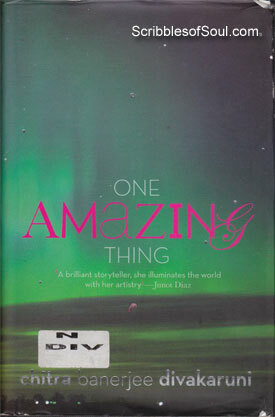 And, there begins the story telling session of ‘One Amazing Thing”. The first story came from the most unexpected narrator. The reticent old Chinese Lady, Jiang boldly takes initiative, and begins to tell her true story, glistening with romantic notions of her hot-headed youth, riddled with the nostalgia of her memories of a bygone era, when she lived in Kolkata with her family, in a dream palace, confined behind the China Wall of suburban city. As Jiang continued her narration, I was transported into her world. I smiled at her secret love bytes and cried with her sorrows. While reading, I thought her story to be the best of the lot. It was emotional, dreamy and yet realistic. However, as I continued with the stories of Malti, Tauriq, Mr. and Mrs. Pritchett, Cameron and Mangalam, I realized that Chitra has played her mesmerizing trick once again. One can never sift her work into best, good and not-so-good categories. She mixes the ingredients in perfect proportions, and yet surprises the reader with a sudden change in taste and color of a familiar dish. And, at the end, one can not point out any shortcomings in her concoction. One has to conclude that her writing was superb, and has to forget the minor aberrations. And, this maxim holds religiously true for the present novel as well. It is futile to discuss the individual stories here, as I can scarcely do justice to them in a short review, and anyways stories are best enjoyed, when you read them from cover to cover. However, I would love to talk about the characters. As is usual with Chitra’s novels, the characters are limited in number, but they are sketched in such a convincing way that the reader can establish a ready link between their stories and lives. If Cameron’s protective urge is symbolic of his frustrations with war and his neglect of filial duty, Tauriq’s distrust of Americans is reflective of the hell he had to endure, while living in a country smouldering with poisonous fumes of suspicions and doubts, where every turbaned man is labeled a probable terrorist. Mr. and Mrs. Pritchett had their disturbing childhood to blame for their apparent coldness about relations. Their tryst with destiny had made them embittered and scared to enjoy the joy of companionship for their entire lives. Lily is a misleading mirror image of her grandmother, Jiang – introverted yet rebellious, a perfect foil for her hidden creativity and stunted talent. Malti and Mangalam who readily gave up their authority as Visa Officers and became subservient to Cameron, pretending him to be better equipped to handle a crisis, also revealed their own insecurities as they narrated their stories. The reason for their callousness and greed, which made them accept lust as an alternative to pure love, was brought into the limelight and did justice to their character portraits. So, overall Chitra presented a beautiful collage of diverse personalities, where they retain their individuality and yet impress as a collective body. I mentioned earlier that Chitra has attempted a novel technique in the present book, experimenting with a series of short stories presented as a novella. On surface, her present work did appear rather unique, as far as her usual style is concerned. However, as I scratched deeper, I still found the old Chitra peeping out of her characters, enlivening the stories with her unparalleled understanding of human psyche. We may conceal our true selves, but actually all of us are desperate to shed our false masks. At times, it becomes easier to communicate your true feelings with abject strangers. And, that’s what happens to the nine characters in this novel as well. They all end up divulging their best kept secrets, and are able to forge a strong bond with each other. Destiny brings them together on pretext of visiting India, a place where all of them hoped to find salvation, however ironically they get it in the basement of Indian consulate itself. In the wake of impending death , the closed vault develops an identity of its own, far removed from the fast life of America, reverberating with peace unattainable even in the lonely caves of Himalayas. As expected, Chitra has peppered her stories with a liberal sprinkling of mysticism and spirituality and it was heart warming to notice a glimpse of Queen of Dreams in Mrs. Pritchett’s story. However, at times, I found the basic framework a bit rickety. Uma’s desperation to get the stories out of her fellow beings jarred as an artificial attempt. I did not really enjoy her story as well. I don’t know why Chitra did not portray her main character more convincingly. Given the less than impressive sketch of the central figure, at times, I thought that perhaps the author tried too hard to imitate Chaucer. It is natural for pilgrims to indulge in friendly story telling sessions, but it seemed a bit out of place in a dingy basement, where you are eying a sure death. But, as a story teller, Chitra has held her ground quite well. Most of the stories appeared fresh, real and inspiring and blended really well with their narrators. All in all, another good offering from Chitra Divakaruni. Though, it could not displace my favorite Sister of My Heart and Vine of Desire from the top spot, it is definitely worth a read.